1017-1021 Market Street, Eastern Outfitting Company. 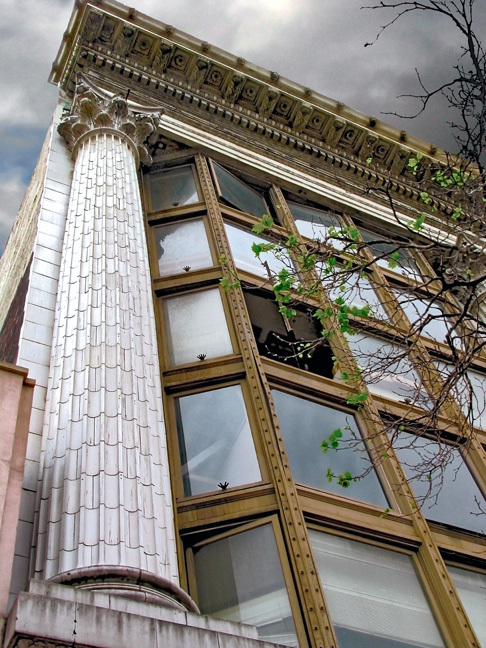 7B stories; brick and steel-frame construction; white sandstone facade; casement windows with copper facing, framed by huge terra-cotta Corinthian order columns; galvanized iron entablature with “Furniture and Carpets” in relief. Architect: George Applegarth. 1909. I remember wishing I could levitate upward and in through the open window above me when I captured this image. As often as I have photographed this building’s exterior, I have never been able to gain access to the upper floors. The little round holes in the window casings are light sockets, 700 to be exact, which unfortunately have not had light bulbs in them for many years. Clippings from the San Francisco Call. (left) 05 September 1909. (right) 26 January 1911. 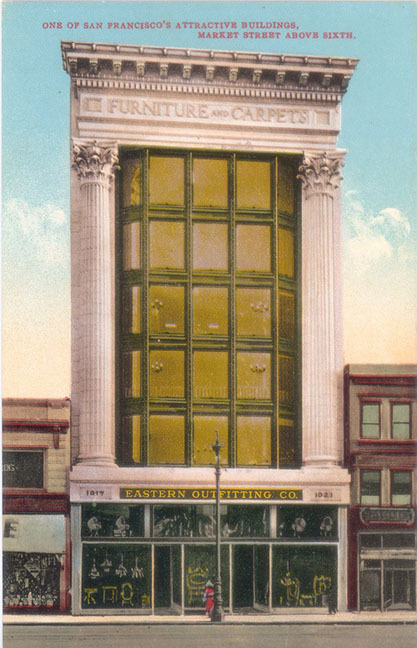 Following the opening of its first store at 1310 Stockton in 1899, the Eastern Outfitting Company did such a bang-up business that in January 1903 the company opened a new store in a much larger building at 1320-1328 Stockton. When that building was destroyed by the 1906 fire, the company set up temporary post-fire quarters at 1970 Mission Street. 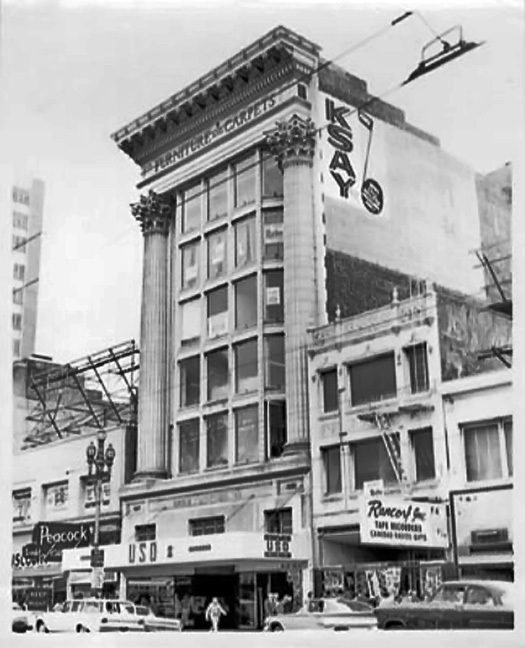 By the time the company opened its brand new store at 1017-1021 Market Street on the evening of 05 September 1909, the Eastern Outfitting Company had branches scattered throughout California and the new building became headquarters for the chain. At the grand opening the store was flooded by a throng of customers and well-wishers, and over a hundred floral arrangements from friends and competitors alike were distributed throughout the new building’s corridors. The employees celebrated by presenting an appropriately engraved bronze plaque to the management. In the late 1940s, the building became the Union Furniture Store. In more recent years, sweatshops have occupied the upper floors and the storefront has been leased by a succession of short-lived bargain stands. 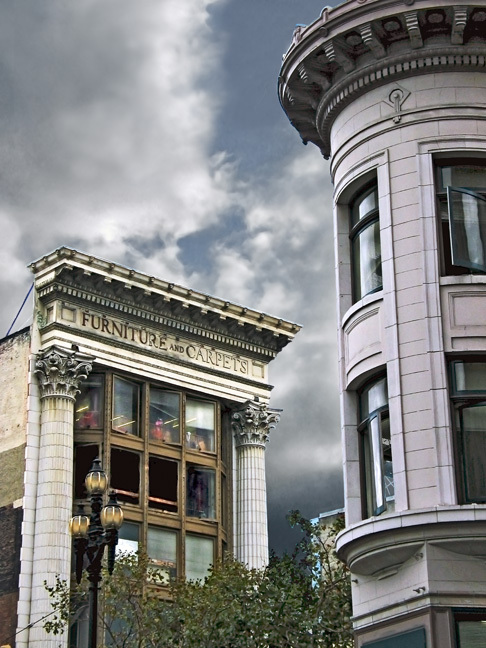 The Eastern Outfitting Company Building is close to where Market Street intersects with Sixth Street, Golden Gate Avenue and Taylor Street. The upper stories of a building in the foreground are part of the San Cristina residential hotel. The ground floor is currently occupied by Show Dogs, the most recent in a succession of restaurants. The building is also where Christian Slater interviewed Brad Pitt in Interview with the Vampire. It is a flatiron building, designed to fit the acute angle of Market Street intersecting Golden Gate Avenue. What appears to be a turret-like structure is actually just the narrow tip of the triangle. From a Market Street sidewalk perspective, the Eastern Outfitting Company Building’s enormous, unrelieved expanses of brick are mostly hidden by the buildings on either side. The illusion created by the false front is largely dependent on looking upward from street level. The giant Corinthian order columns and capitals are constructed of terra-cotta tiles; and the entablature, seemingly so massive, is in fact hollow—a galvanized-iron box. Architecture like this is for me transcendent; it turns the street into a stage set, which makes otherwise hidden parts of the building even more tantalizing. The deus ex machina, you might say, is the utilitarian brick that makes up the building behind the facade. 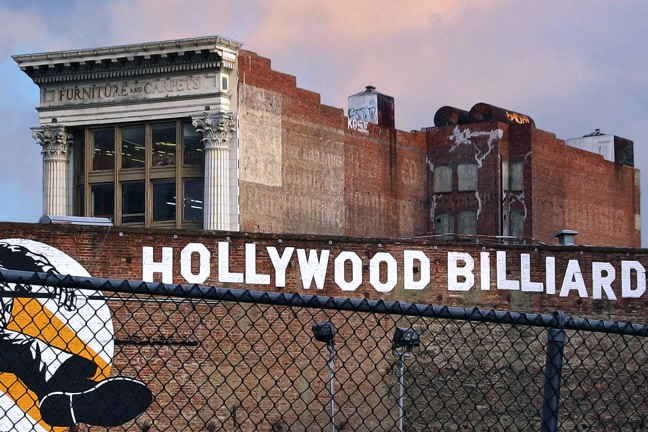 Across Market Street from the Eastern Outfitting Company Building, the rough brick wall advertising Hollywood Billiards used to abut the beautiful Paramount Theater, which was razed by the Shorenstein Company to make way for . . . a parking lot.